Are you guys good at meal prepping at the beginning of the week? I’m the worst! However, I’ve learned the hard way that meal pep (specifically lunch prep) at the beginning of the week is key to success. This recipe is a great example of that. Lunch is always our toughest meal of the day. We don’t have as much time to prep, eat and clean up. With that being said, whether you’re working a physically demanding job or need your brain to be sharp at a desk, I think lunch needs to be treated just as important as breakfast and dinner. This recipe comes together in a flash if everything is prepped before hand–ie: make the sauce, spiralize the vegetable noodles, roast and shred some chicken, hard boil eggs, slice your radishes, etc.) and store everything in separate containers in the fridge. What I love most about this recipe is that it travels well and is packed with healthy fats, protein and veggies to help you tackle whatever your day entails. Oh yeah, and the sauce? It’s killer and one of my all time favorites. It’s stores for over a week in the fridge so make a large batch for all your noodle bowls, veggie dipping or spoon licking needs! We’re still pulling winter radishes out of the ground (hello beautiful watermelon and black radishes!) and it’s been fun adding them to simple veggie noodle bowls like this. If you don’t have a spiralizer and don’t want to make the sweet potato noodles you can simply cook up some rice noodles and use them instead. Also–it’s totally optional to cook the sweet potato noodles. I go back and forth between eating them raw in this recipe or giving them a light sauté. Either way, they’re delicious. Heat the olive oil in a large skillet over medium heat. Add the sweet potato noodles and cook, tossing often, until al dente. About 5 minutes. Remove from the heat and set aside. 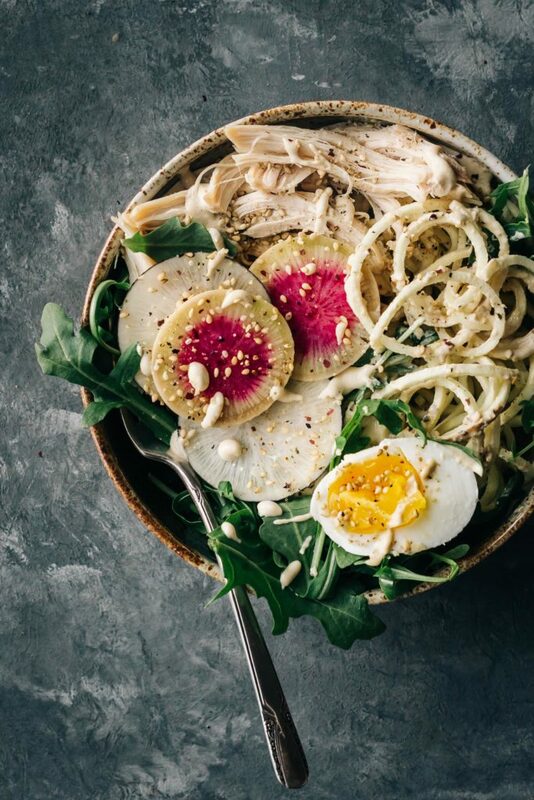 Divide the noodles between 4 bowls and top with shredded chicken breast, radishes, avocado, hard boiled eggs, arugula and sprinkle with toasted sesame seeds. Prepare the sauce by combining all the ingredients together in a small food processor or use an immersion blender to puree everything together. Taste for seasonings and adjust as needed. Drizzle the sauce on the noodle bowls and enjoy! This looks great! Do you have any suggestions on vegetarian substitutes for the chicken in the dish?